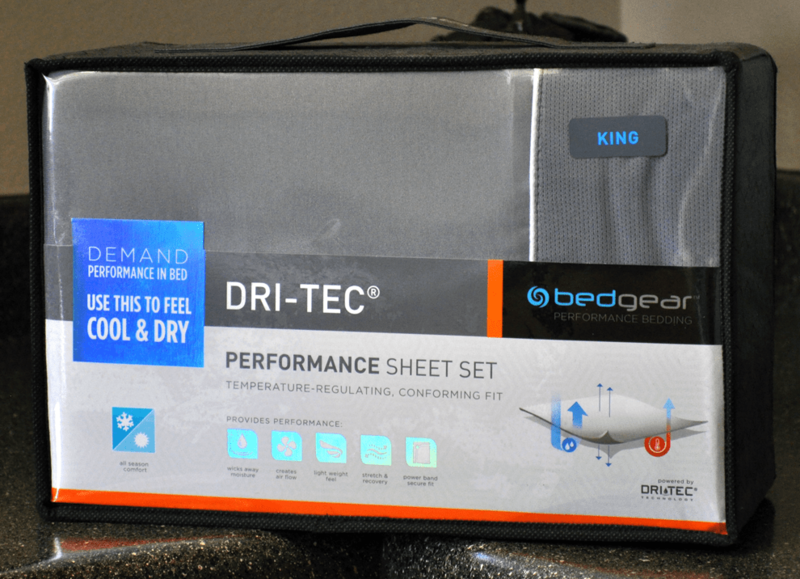 In this week’s review I’m exploring Bedgear’s Dri-Tec performance sheet set. After reading about the materials used in these sheets, I was quite excited to test them. Framing their design around the active lifestyle, Bedgear is known for their cool, comfortable, and high-performance sleep products. Continue reading below for my full review. Don’t have much time? Click here to hop down to the review summary. The Bedgear Dri-Tec performance sheets are made of 100% polyester. Included is 1 fitted sheet, 1 flat sheet, and 2 pillow cases for any size above Twin XL (Twin and Twin XL – 1 pillow case). The sidewall of the fitted sheet consists of 92% polyester and 8% spandex. This combination of materials works to create an elastic band feel around the mattress. So instead of a traditional 4-corner band-fitted sheet, the Bedgear sheets have one large elastic band covering the entire mattress. 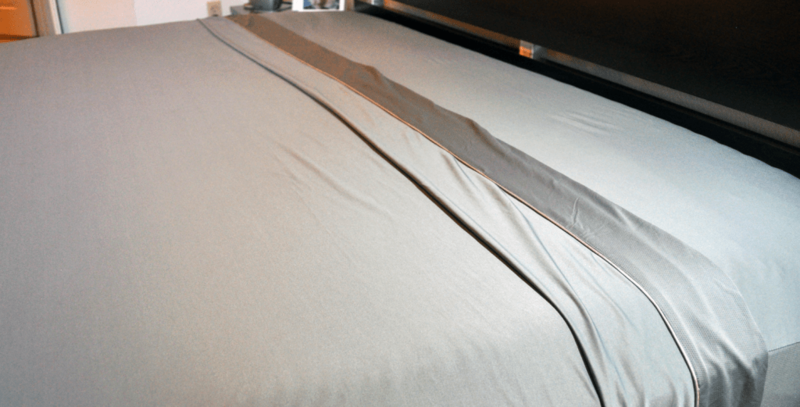 This design was implemented to avoid rising fitted sheets throughout the night and ensure a tight fit to your mattress. Using similar materials to that of sportswear, this sheet set is able to stretch, breathe, and keep you cool during the night. The flat sheet and pillow cases are also well made. The Dri-Tec sheets work to wick away heat and moisture from the body. While some sheet sets retain heat and create a warmer night’s sleep, the Dri-Tec sheets dissipate the heat and help to circulate air. The sheets work to scatter the heat so there is never any build up at one point on your body. This sheet set is machine washer and dryer friendly. While looking at the build quality of sheets, I am mainly concerned with the stitching, materials, and overall construction. With regards to the materials used in the Bedgear Dri-Tec sheets, they hit this one out of the park. The polyester comes together to provide a sleek look while maintaining a sturdy build. The stitching of this sheet set is quite simply exceptional. After closely analyzing all of the stitching, I found virtually zero imperfections. Aside from a few loose threads around the elastic band, the set proved to be very carefully made and tightly knit. Both pillows and the flat sheet were nearly flawless as well. Although there were a few threads on the fitted sheet, none of them look as if they could lead to further deterioration. The entire set seems sturdy and dependable. The fitted sheet has a deep enough pocket to act as a universal fit for most mattresses. With this universal fit comes adaptation. This means the sheets are able to stretch to larger mattresses and remain tight for shallower mattresses. There is no excess fabric after placing it on the mattresses. Overall, the Bedgear sheets are quite impressive in terms of build quality. Putting the sleeper’s needs first, Bedgear did a great job constructing sheets with qualities that will last. To test the durability of the Dri-Tec sheets I took a few different factors into account. To kick it off, shrinkage. The biggest concern is a sheet set that shrinks drastically after being washed & dried. This could lead to the wrong fit for your mattress. In addition, shrinkage can indicate a low quality material. Next, I search for any damages to the sheets that could be a result of washing / drying. Are there noticeable threads coming out? Did any existing threads get worse? Does the mattress still posses the same quality as before the wash? Finally, I test the color materials used to determine if there is any run of the dye or colors. For my shrinkage test I measured the pillow cases and flat sheet before putting them though a standard wash and dry cycle. These measurements serve as my start point. I then moved on to wash and dry the sheets. After doing so, I saw very minimal shrinkage. 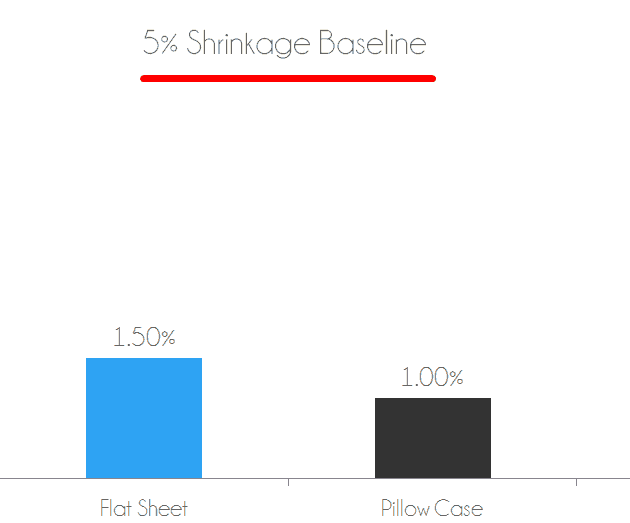 The flat sheet shrank in size by 1.5% compared to the original size while the pillow case shrank 1% compared to its original measurements. Most shrinkage occurs on the first wash / dry so I would not expect to see much more, if any shrinkage in the Bedgear Dri-Tec sheets. These shrinkage levels are among the very best I have seen to date and well within normal limits (anything within 5% is good). 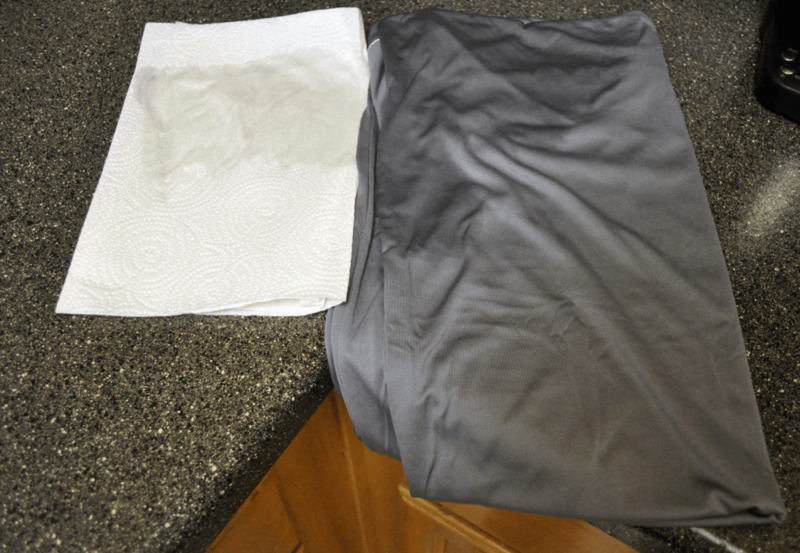 Shrinkage test – flat sheet shrank by 1.5% after wash / dry. Pillow case shrank by 1% after wash / dry. In this test I am assessing the set for any damage that could’ve been caused by normal use or the wash / dry cycle. Before putting the sheets through the wash cycle there were hardly any loose threads. This set was virtually flawless in terms of stitching. After a few weeks of normal use and washing / drying the set I did not see a change in quality. Overall, the sheets held up very nicely. For this test I soaked a pillow case in hot water, allowing it to fully absorb the water. Immediately after, I rung out any excess water by hand, and placed the pillow case on top of a bed of paper towels. While the pillow case was still fully wet I used a rolling pin to press the pillow case firmly against the paper towels. Typically, lower quality sheets will bleed and allow dye to run onto the paper towels. This was not the case for the Dri-Tec sheets. There was no sign of dye transferred from the fabric to the paper towels. The overall feel and look of the Bedgear sheet set is sublime. With the option of 4 different colors (aqua blue, champagne, grey, & white), these sheets provide a sleek and modern look. In addition to the clean look comes a delightful feel. At first touch, the sheets were smooth and very cool. Feel is of course subjective, but if I had to rate the sheets on a softness scale I would give them a 2-3 out of 10 (1 being the softest). Unlike traditional cotton sheets, these sheets have few wrinkles. The polyester helps to maintain a sleek look at all times. With that modern look also comes the motion transfer reduction. With most cotton sheet sets partners can feel each other tossing and turning at night. The Dri-Tec sheets are so smooth and light weight that they won’t cling to your body, helping to avoid waking your partner at night. What I like most about these sheets is the cooling factor. These are among the most cool sheets I have tested to-date. The ability of the sheets to work together to dissipate heat only adds to the airflow panels, light weight feel, and Dri-Tec technology. Additionally, the sheets are able to flex with your movement, so heat is not trapped in one specific area. The highly breathable tecnology keeps air flowing while maintaining consistently cool temperatures. Who Should Buy the Bedgear Dri-Tec Sheets? The Bedgear Dri-Tec sheets are an exceptional product. Durable, modern, and high quality sheets that are built to last. Want sheets with very good cooling – made from 100% polyester these sheets have exceptional cooling. Dri-Tec tecnology is closely related to high performance athletic wear and works to wick away moisture from the body at night. This process makes for a very comfortable, cool night’s rest. Want high quality & durable sheets – with regards to quality and durability, these sheets are extremely good as well. The build of this set is virtually flawless and made from materials that are known to last. The ability to stretch helps to avoid splitting seems or tears in the sheets. Dri-Tec is able to regain its normal shape and composure after being stretched. This also feeds into their ability to fit almost any mattress. Want quiet sheets – The material is designed to regulate body temperatures and prevent the tossing and turning that most cotton sheets possess. This feature combined with the minimal noise created from movement adds up to an all around great sheet set. The Bedgear Dri-Tec sheets are more than just another sheet set. The 100% polyester design makes for a very cool and comfortable sheet set. From the universal fitted sheet with airflow panels to the smooth pillow cases, these sheets go above and beyond to keep the sleeper cool. With exceptional build quality and durability, the Dri-Tec sheets were made to last. Although they were designed with the active lifestyle in mind, these sheets have proven to offer qualities that suit the needs of most sleepers. The modern look mixed with the performance feel makes for a great option for anyone looking for a cooler, more comfortable sleeping experience.